In Part 1 and Part 2, I have tried to convey my awareness of life in a new and changed environment. It was an environment more rural than Lamont. It was a life with less money than before and as a result, I was more aware of the difficulties of life. We lived in three other locations in Colorado; two places in Castle Rock and one in Denver. 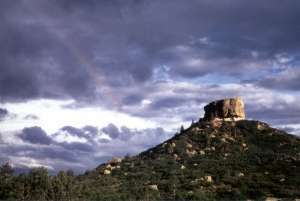 Castle Rock is about 30 miles south of Denver and about 35 miles north of Colorado Springs. Interstate 25 connects these cities, going North and South. From what I understand, Castle Rock is now a desirable place to live. It has golf courses, fancy homes, and the good life. In the early 1960’s, it had a large butte rock hill that a community was built around. We lived in a small house on 7th Street, just off Wilcox. We were the only house on the street, as it was a dead end street one block long. Just east of us was a railroad track. Across the track was the base of Castle Rock, the hill. Across the street, was the junior high school that I attended. We had a great view of the playground and those on the playground, had an unobstructed view of our front yard. The whole family lived in the house, with Dad gone during the week. I think he was working in Trinidad at the time. My brother had just signed up with the Navy and our time of all of us living together was coming to an end. As I have said earlier, I was fairly naive and innocent. I just lived in my own world and didn’t pay much attention to anything else. I remember one day when Larry had a friend over. We rarely had friends over. I don’t think Mom tolerated it very well. Larry leaned over to his friend and said, “Watch this!” He looked at me and gave me the middle finger salute. I didn’t know what it meant, but instinctively I knew it wasn’t good. So I jumped on Larry, trying to wrestle him. Larry thought it was hilarious and was rolling around, with me on top of him, laughing his head off. We had wrestled together often. Usually I was trying to protect myself from him tickling me. He had tickled me until I vomited, but strangely, it was not malicious, he was just trying to have fun with me. Before he left for the Navy, I was home sick from school. I had just started the seventh grade. Again, we lived across the street, less than forty feet from the playground. Classes were outside for recess. Larry had a great idea for his kid brother. He grabbed me. I thought “Is he going to tickle me till I throw up again? That won’t take long.” I quickly understood he had something else in mind, when he swiftly removed every stitch of clothing I had on, opening the front door, shoving me out into the front yard, locking the front door; all in one continuous motion. Here I was, a pale white skinned naked seventh grader, with a sour stomach kneeling on his front yard. In my mind, all the noise and movement of the playground stopped. The whole school and yes, the rest of the town was now in formation on the playground. Twenty in a row for a hundred rows, standing at attention, each with their right arm straight out, at shoulder level, pointing and laughing at the naked kid with a sour stomach. Now the reaction of those on the playground may not have happened as I imagined, because I did not remain in a kneeled position. I scurried behind the only bush in the yard. I waited until recess was over and slivered back into the house. I’m sure I will forget that day, when he was just trying to have fun with me, someday. I still love my brother and he loves his kid brother, but I keep my eye on him during recess. Living next to the railroad track was exciting loud. When we heard a “northbound” coming, we would do one of two things: one was to lay a penny on the track rail waiting for the train to pass, then to retrieve the flattened copper disc. Secondly, we would crawl into a galvanized culvert that was just over the front yard fence and crawl to the center of darkened pipe. The ground would begin to vibrate and the sound of the approaching train became deafening. As the train passed overhead, we would scream in a primal yell, that only the two of us could hear. When the train had passed, we crawled out in to the sunlight and look at each other and smiled. We had overcome once again. A few years ago, Terrie and I were in Castle Rock. I had not been there in over thirty years, but I drove right to the house. There was someone still living in the small house. The junior high school had become a school administration building. The playground was now a parking lot. The train tracks were still there and the galvanized culvert was still there. I had remembered it being very large; its actual size was only about two feet wide. There are other stories that took place in this house, but I think it best to let them pass. Learn from them, but let them go. The other house, in Castle Rock, was just south of town. I remember when it began to snow, the light snow dancing across the black asphalt of the access road, driven by a north wind. Side to side, the snow would go. Meandering like a translucent stream. I was fascinated by it, like when I first saw mirages in the California desert. These were creations, at the opposite ends of the thermometer, which caught my attention. The back of this house was unfenced and extended to a creek. The back yard was sloping downward to the creek and was uneven and had some rocks embedded in the ground. It was not uncommon for Brenda and me to go down to the creek to play. We would scale the face of the east wall of the creek, pretending it was the Rockies or even the Alps. A certain day, we found an old baby carriage. It was broken in spots, but still had four wheels. We decided to use it to push Brenda down the sloping backyard, into the creek. We brought it to the top of the hill, placing Brenda into the carriage. I grabbed the handle and began running with all I had. About half way down the hill, I ran into a rock that stopped us immediately. Just like when I flew over the handlebars of my brother’s bike, I went flying over the handle, and crashed. My face was sliding on the rough surface until it came to a jerky stop. I stood and found Brenda had been stabbed by the carriage frame. We could see the whiteness of her bone. Brenda says I told her to “go, see Momma!” But Mom was at work. We started to the house to take care of the wound. Mom was there. She said the Lord had told her to go home, she was needed there. She left work before the accident even happened. The Lord was protecting the ignorant ones. We moved to Denver, in a house near the old Montgomery Ward building at S. Broadway and Alameda. I was to finish the seventh grade here. Larry was away in the Navy. Dad was working in Denver and Mom as working as a nurse’s aide. It was here, that we watched Ed Sullivan on Sunday’s. It was here, that I got very tired of watching “Wizard of Oz” every year, because Brenda liked it. It was here, that my bedroom was in the screen-in back porch. It was here, I began with a “you can’t hurt me” attitude. I walked about three quarters of a mile to school. My last school was just across the street. This school was in the capital city of the state. I was worried I couldn’t find my way, but my inner “bulldog” began to emerge and I was determined to get there. I remember being splashed by a dry cleaning truck, one morning. That may have been the birth of my “look”, a blank face with a dash of perturbed and a shot of annoyance. Ok, you can’t hurt me; I went to school wet and dirty. Another day, a neighborhood kid and I were both interested in a particular girl. We began verbal jousting; he said something about how ugly my shirt was. I took my shirt off and threw it on the ground. He ran over it several times on his bicycle, even braking as he got to the shirt. Ok, you can’t hurt me; I went home without a shirt. Another day, in gym class, we were to climb the two inch rope. You know that rope; it’s tied to the North Star. It looked impossible for me to climb. I was beginning to get a sour stomach. Sitting cross legged, on the gym floor, I waited for my turn. Sitting to my right, was a blind kid. He moved his left hand, slowing, toward my exposed right arm. His bony fingers touched my arm. I thought to myself, “If he is going to tickle me, I’m going to vomit – on him!” His left hand was near my elbow. He brought his right hand across his body and placed it a little lower than his left hand. I’m thinking, “How is he going to tickle me this way?” Suddenly, he began twisting his hands on my arm, giving me what was then called an “Indian arm burn”. That hurt. Then I got confused. I wanted to hit him, but didn’t think it would be right, because he was blind. On the other hand, he would have never seen it coming. I didn’t have to make the decision, because I was next up to climb the rope to the moon. We left Colorado and moved back to Oklahoma. Getting older and becoming aware of yourself and life is not always easy. Hopefully, we are open to God’s plan for us and learn to grow through the pleasant and unpleasant circumstances. I welcome your likes and comments.